NASHVILLE, TENN. (February 26, 2019) — Racking up six career appearances on NBC’s The Tonight Show Starring Jimmy Fallon, including a recent Valentine’s Day performance of “Talk You Out of It,” FLORIDA GEORGIA LINE returned to the show last night (2/25) as “family,” according to the late-night host, to be a special part of the fifth anniversary celebration. Among big named guests including TINA FEY, ROBERT DE NIRO, and BEN STILLER, the global entertainers amped up their comedic chops during the behind-the-scenes-style episode in salute of HBO’s The Larry Sanders Show. 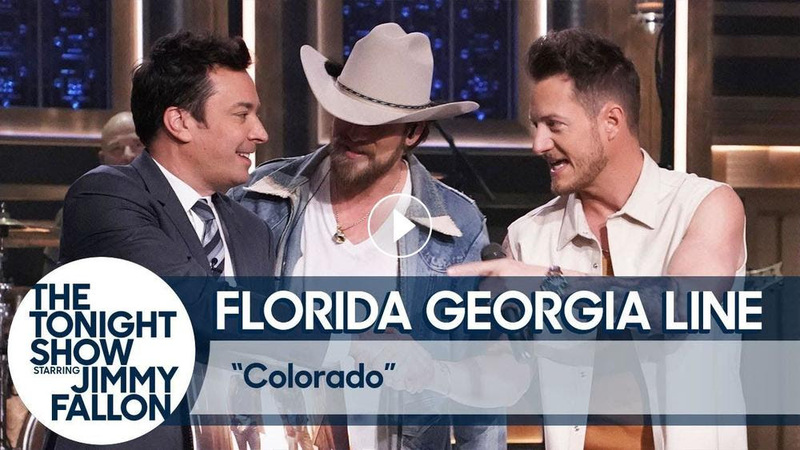 Watch as FGL performs their high-riding tune “Colorado” from CAN’T SAY I AIN’T COUNTRY (BMLG Records), while their scripted “Big Loud Manager Jasper Hoggs” hilariously tries to snag them prized couch time. Presale tickets for the superstar duo’s 2019 CAN’T SAY I AIN’T COUNTRY TOUR – featuring DAN + SHAY and MORGAN WALLEN plus special guests HARDY and CANAAN SMITH on select stops – became available today (2/26) beginning at 10 a.m. (local time) for FGL’s fan club, FGL Lifers, with Citi cardmembers gaining access at 12 p.m. (local time) through Citi’s Private Passprogram. Citi is the official presale credit card of the 2019 CAN’T SAY I AIN’T COUNTRY TOUR. Presented by FGL’s Old Camp Whiskey, the ultimate start to any party, and supported by number one Texas craft beer Shiner Bock, tickets go on sale to the general public on Friday (3/1). Live Nation is the official tour promoter.